If you're thinking about taking a gamble on a new plant, the genus salvia is a good bet. With origins in geographical regions as varied as Africa, Asia, Europe and the Mediterranean as well as North and South America, salvias are so widely adapted that just about every gardener can find a few varieties that will work in their garden. With more than 900 known species, salvias (or sages, as they are commonly known) comprise the largest genus in the mint family. References to their cultivation and usefulness in medicinal and household remedies can be found in texts dating back to Roman and medieval times. Salvias contribute to the health and well being of wildlife as well as that of humans. They benefit habitat gardens by attracting hummingbirds, seed-eating birds (particularly goldfinches), nectar-seeking butterflies and beneficial insects. In addition to providing food, salvias provide seasonal protection and cover for birds. It’s easy to work a native California salvias into a collection of other California native plants. 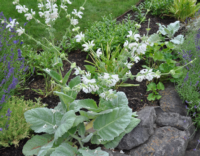 Salvia apiana (white sage) has highly fragrant, whitish-green leaves containing aromatic resins that scent the air on hot days. This distinctive fragrance has contributed to the commercial use of salvia apiana leaves in teas and soaps. The woolly leaves of this drought tolerant, shrubby evergreen are elliptical in shape and grow in whorls, so this plant keeps its good looks long after the lavender-white spring blooms have faded. Another local hero is salvia sonomensis (creeping sage). 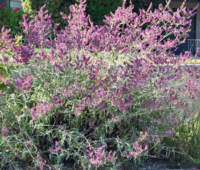 Like its Latin and common names imply, this drought tolerant, shrubby perennial sage is native to Sonoma County and grows low to the ground, forming an 8- to 10-inch-tall mat of foliage. The blooms range in color from light lavender to purple, and provide a high-impact effect on a slope or bank. This late-spring/early-summer bloomer likes good drainage and sun, but it also can take some high shade. Salvias don't just add value when they are in bloom. There are quite a few of them that provide interesting and unusual foliage. Salvia argentea (silver sage) is a real textural stunner, with a flattened, low (1 to 2 feet tall) rosette of woolly silver foliage. In summer, this biennial sage sends up multiple branches of 1-inch, white (sometimes tinged with pink or yellow) flowers. Cutting the blooms back when they fade extends the life of salvia argentea, but if you want to be adventurous, you can try propagating the ripened seeds to multiply your fuzzy brood of this striking plant. Plant it within reach of a garden path, because visitors to your garden will want to touch it. 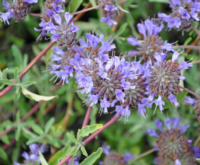 Another sage with interesting leaves is Salvia cacaliifolia, a perennial "cascader" from Guatemala and Honduras that grows in the wild at 5,000- to 8,000-foot elevations and bears blue ½-inch flowers. This salvia can take full sun, but it appreciates the protection and shade that it can get when situated under taller plants. The arrowhead-shaped leaves are borne on trailing stems that grow 2 to 3 feet tall and arch over banks and retaining walls. Plants will take root where stems come in contact with the ground, and offspring can be propagated by dividing rooted stems. Salvia ‘Allen Chickering’ is one of California’s native sages. It grows 4’ tall and wide and bears 2’ whorls of lavender flowers in spring and summer. The foliage is grey green and exudes a lovely fragrance. This sun-loving shrub appreciates well-draining soil and little water in summer. It is sure to attract hummingbirds, bees, and butterflies. The aptly named forsythia sage, Salvia madrensis, is a perennial native of Mexico that spreads by rhizomes and sends up 5- to 7-foot-tall stems with green, heart-shaped foliage resembling those of tropical plants. Protect this one from frost and enjoy the late summer show of buttery yellow blooms that cover 1- to 2-foot-tall stems. Salvia canariensis is a large shrub that grows quickly to 6-8’ in diameter. The foliage is fuzzy, grey-white, and shaped like arrowheads. When blooming in summer and fall, the flowers smother the plant in a cloud of bubblegum pink. Cooks and aromatherapy enthusiasts have enjoyed sage for centuries. Most traditional culinary and medicinal sages are varieties of Salvia officinalis, and range in color from pale gray-green and golden ('icterina') to purple and variegated ('tricolor'). 'Berggarten' is a compact-growing cultivar of salvia officianalis from Germany with soft, hairy, bluish-green leaves that are rounder in shape than others of the species. It is widely considered to be longer lived and one of the better flavored culinary sages. With fewer flowers and a tidy, round shape, 'berggarten' looks good tucked into an easy-to-reach border where you can grab leaves for the kitchen whenever the mood strikes. Play around with your color palette by grouping different species of salvias with similar foliage and a variety of flower colors. You can even find unexpected color combinations within one plant. The yellowish lime-colored stems and calyxes of 'limelight,' a cultivar of salvia mexicana, contrast with their violet flowers to pack a real visual punch. 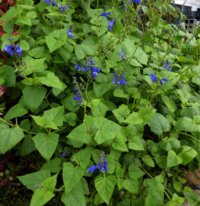 While many commonly grown varieties of salvia are drought tolerant, one notable exception is salvia uliginosa (bog sage), a 4- to 6-foot upright plant with blue flower spikes. This South American sage can be found growing in marshes and wet places. Given its preferred wet growing conditions, salvia uliginosa can spread rapidly by sending out underground runners, so if you want to limit its spread, either sink it into the landscape in a can or water it infrequently to keep rapid growth in check. While salvias aren't generally considered high-maintenance plants, they can suffer occasional bouts with fungal diseases and infestations of aphids or thrips. Some species also fall prey to slugs and snails. 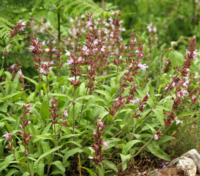 Since salvias are so varied and occur in so many habitats around the world, there aren't any hard and fast rules concerning cultural practices that can be applied to the entire genus. Two general and practical guidelines to follow are to plant salvias in fast-draining soil, and to provide occasional top dressings of compost.